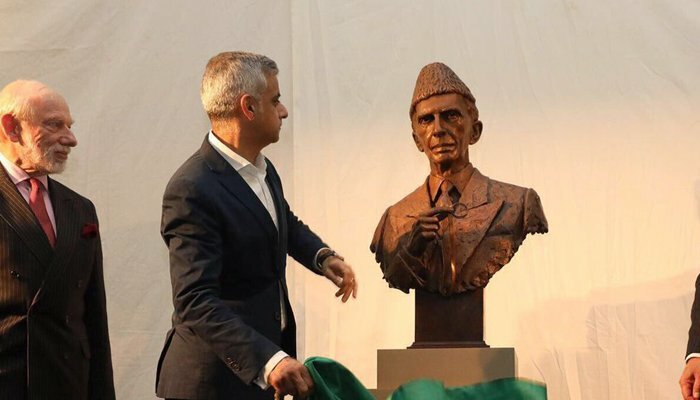 LONDON: London Mayor Sadiq Khan unveiled Tuesday night a bust of Pakistan’s founder Quaid-e-Azam Muhammad Ali Jinnah at the British Museum at a ceremony attended by various top officials. Revealed at an inauguration ceremony by Sadiq Khan, the bust will be moved to the Lincoln’s Inn — its permanent home. Khan posted images of the event on Twitter, saying he was “proud to unveil this bronze bust to honour the great” leader. Syed Ibne Abbas — the Pakistani High Commissioner to the United Kingdom who was also in attendance — also made a statement, saying Quaid-e-Azam’s struggle brought a reward in the shape of Pakistan. In his youth, Jinnah had travelled to London in order to pursue studies in law at Lincoln’s Inn from 1892 to 1896. His presence in February 1895 is confirmed by the British Museum in a register for the readers.